This section to to help estate and letting agents navigate through our website for the most appropriate displays for this industry. 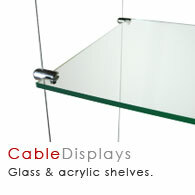 Cable Display Systems are the most commonly used window display system for estate agents. 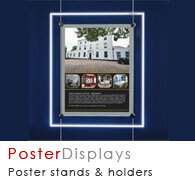 We have a large variety of poster display sets to suit your needs. 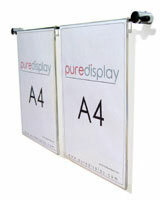 Cable Display System - Choose from A4, A3 and A2 poster sizes. 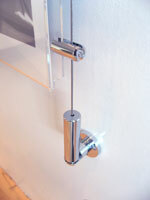 These are easy access poster holders, designed for frequent poster changes. The same style of system used for window displays can also be used for wall to wall mounting, with the use of additional wall brackets. 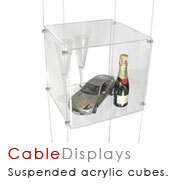 A lower cost alternative for wall displays, which still has the easy access functionality and the contemporary styling. Ideal for certificates and photographs, but also if you want to create a more flexible wall layout design. A4 Portrait Desktop Poster Holder - Display special offers or exclusive properties at each desk for customers to look at whilst they are sat down. Outdoor Leaflet Holder - Allow customers to pick up your property summary leaflets 24 hours a day. Choose from a large selection of ready-made combinations. If you don't see the combination you require, please email us with your request. If you don't see the combination you require, please email us with your request. 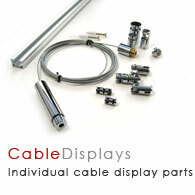 Browse these categories under "Cable Displays"